Sitting on the side of Battle Mountain about 12 miles southeast of Avon, Colorado is the old company town of Gilman. The now abandoned town was originally founded in 1886 by miners searching for silver, but later became a center of lead and zinc mining. By 1876 several lode silver-lead deposits had been found in the area, setting off the Colorado Silver Boom. 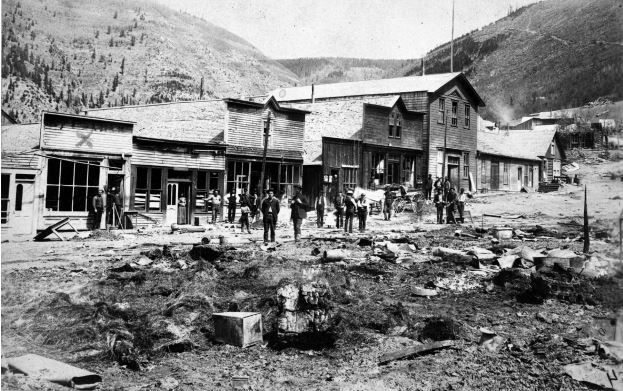 The rush began in nearby Leadville, as thousands flocked to the town to dig for their fortunes. Soon, the miners spread out, with many of them filtering down Tennessee Pass, traveling over old Ute Indian trails. As more adventurers swarmed to the area, the trail was widened to allow teams of mules or oxen. However, the route remained treacherous and was aptly named “Battle” for a reason. By 1879, ore strikes were made in what would become the Battle Mountain District, the first in Red Cliff. The same year, Kelly’s Toll Road opened, generally following the same path as present-day Highway 24. It started in Leadville and continued over Tennessee Pass and down Battle Mountain to the Eagle River Valley. Numerous miners then spread deeper throughout the canyon and on to the steep slopes of Battle Mountain. Judge D.D. 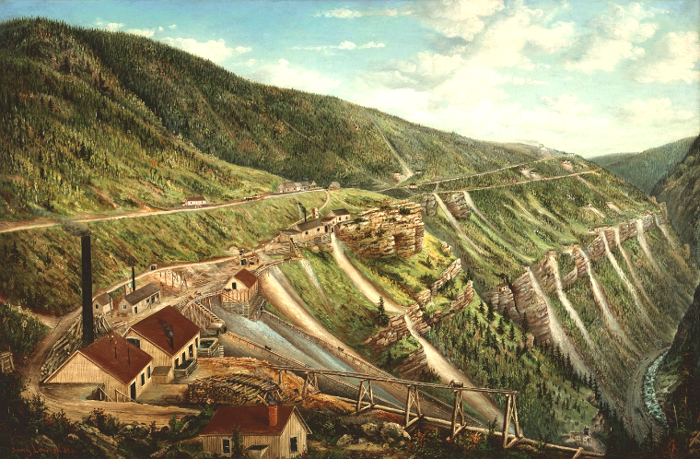 Belden discovered what would become the Belden Mine in May 1879. Later that year, Joseph Burnell, a Leadville newspaperman, discovered what would be developed into the Iron Mask Mine. Other mines would soon be discovered including the Black Iron, Ida May, Little Duke, Ground Hog, May Queen, Kingfisher, Little Chief, Crown Point, and Little Ollie, the oldest dating back to 1878. Here, a number of mining camps sprouted up called Belden, Rock Creek, Bells Camp, Cleveland, and Clinton (later called Gilman). 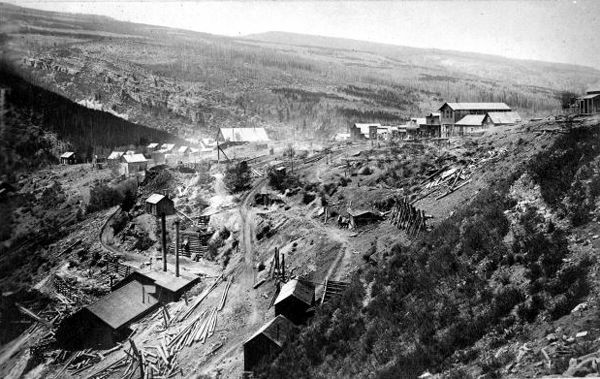 By 1880, Battle Mountain had a smelter, a stamp mill, a sawmill, and a mining district with elected officers to settle disputes about the scores of scattered mining claims. 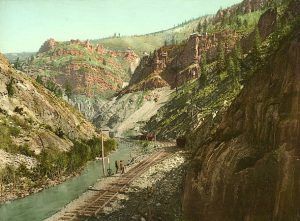 The Denver and Rio Grande Railway reached Redcliff in November 1881 and by the next year extended through Eagle River Canyon with a station at Belden at the base of Battle Mountain. By this time Redcliff had become Battle Mountain’s first boomtown, with two saloons, several hotels, an opera house, and a number of other businesses. One of the many area miners during this time was a man named John Clinton, who was also a judge and speculator from Red Cliff. 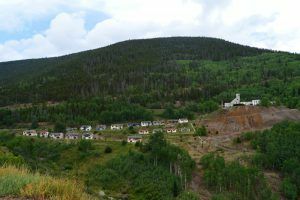 In the early 1880s, he acquired a number of mining operations in the vicinity, including the profitable Iron Mask Mine, which would become the principal producer of lead and zinc within Colorado for decades. Near the Iron Mask Mine was a growing population of log cabins and tents along the steep mountainside. Clinton soon improved the mining operations and established a mining camp on a 600-foot cliff above the Eagle River on a flank of Battle Mountain. Sitting at an elevation of 8950-feet, the camp was named for him. The first building in Clinton was a saloon built in 1884. In 1886, the Iron Mask Mine constructed the first tramway on the slope of Battle Mountain to connect the mine with the railroad at the bottom of Eagle Canyon. Afterward, the mine began shipping over 100 tons of ore per day. The same year, the Colorado state inspector of mines estimated that the Iron Mask contained 100,000 tons of ore worth $3,482,000, and the mine’s workforce of fewer than 80 employees doubled in two weeks. 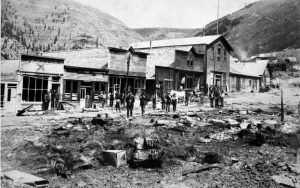 With the increase in mine production and the bright prospects for the future, the Clinton mining camp quickly transformed into Battle Mountain’s second boomtown. In 1886, it received its first post office and was renamed Gilman to avoid the chance of confusion with Clinton, California. It was named for Henry Gilman, the well-liked superintendent of the Iron Mask Mine. Henry Gilman had also donated land for a schoolhouse and served as president of the first school board. By late 1887, the fledgling town boasted a hotel, a boarding house, a general store, a billiard hall, a sampling room, a newspaper called the Gilman Enterprise, several saloons, and a population upwards of 1,000 people. Like many other mining camps, it also hosted a number of rowdies who might ride their horses into a saloon, shoot out the lights, and conduct acts of banditry and violence. By 1890 the initial rush was over and the population of Gilman dropped to 442. The silver crash of 1893 caused an immediate cessation of many of the mines and the Battle Mountain mines decreased production. The operations at Gilman would not resume fully for twenty years. In 1899, Gilman was almost entirely destroyed by a fire that took down the Iron Mask Hotel, the school, the shaft house of the Little Bell Mine, and much of the business district. By 1900, some $8 million in silver, gold, and lead ore had been recovered on Battle Mountain. However, by this time, the area mines were no longer producing much silver and turned to mining zinc. In 1905, The Eagle Milling and Mining Company reopened the Iron Mask Mine with a new emphasis on zinc production and installed a roaster and magnetic separator that separated out the zinc minerals. In 1912, the New Jersey Zinc Company began buying up the claims and land on Battle Mountain, including the town of Gilman, and the days of independent miners came to an end. The Iron Mask Mine was renamed “Eagle 1” and “Eagle 2” by 1919. The mining operations transitioned increasingly to zinc, although the Eagle Mine was still the leading producer of silver in the state in 1930. Eventually, the mine boasted 62 miles of tunnels beneath the mountain.